The country may be in a recession but that hasn’t stopped General Motors (GM) from raising prices on some of their most popular pickup trucks. 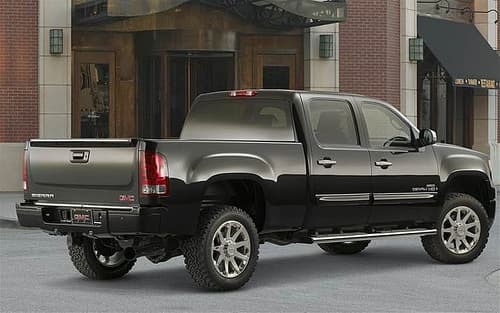 The GMC Sierra and the Chevrolet Silverado have both seen increases of up to $1,500.00, says a spokesperson for the GM Corporation. Earlier this year GM had made comments that it not increase prices on newly redesigned pickup trucks so that they were able to aggressively bring those new models to the market and reach a wider audience. That being said, after a spokesperson made the comments about the increase, they also said that GM will begin offering up to $1,500.00 is cash incentives to try and help with offsetting the price increase. That cash back offer will only be effective until the end of October. Now that GM has launched the GMC Sierra and the Chevrolet Silverado, the trucks appear to be hitting the stride that the company has expected that they would. Now that the push to sell 2013 models is almost complete, the increase in the 2014 GM pickup trucks is simply part of growing a successful business. In addition to the GM trucks being the best in the industry, they are also the best value for the money as well, says a spokesperson for GM. This price increase comes following a month where sales slowed for GM, and segment leader Ford Motors saw a sustained strong demand for their F series pickup trucks. Ford saw over 60,000 units sold in September 2013, while GM had a combined 45,000 in sales between the GMC Sierra and the Chevrolet Silverado. A spokesperson for GM says that although the preliminary numbers seemed down, two things must be considered. The GM Silverado was recently named Consumer Reports naming it the top pickup truck, during a month where GM was in the midst of changing over the 2013 and 2014 models.He believes that the changeover had diminished numbers but once the Consumer Report was released, and now that the 2014 push is in full stride, that numbers will see a significant rise in coming months. Ford is currently offering a $2,500.00 cash back incentive, which did hurt the GM sales. GM feels that although the price of their pickup trucks is on the rise, consumers will see that not only are they the highest rated trucks in the industry, but that they offer the buyer the best value for their dollars.